flaky puff pastry for a delicious, savory dinner! I have a funny story to tell you. Funny, albeit embarrassing. I've been working on a new recipe for a few weeks now. It was something I developed, but it turned out to be a flop. Not a tiny flop either, a big flop. I made a spinach and Gruyere souffle. I take that back, I made THREE souffles. The first two were failures. The first one didn't rise at all, and the second raised just a bit. Finally, on the third try, I had perfected the recipe and it was puffed up just like a souffle was supposed to be. And it tasted delicious! The bad part was that the pictures were awful. When I say awful, I mean AWFUL. I just couldn't post it and share with you because it looked hideous! Fast forward a bit, and I decided to give up on my souffle. We needed a break from each other. So instead of making and sharing that souffle, I made spinach Gruyere turnovers instead. Let me just say, this is a very good thing for you. These turnovers are the bomb, if I may say so myself. 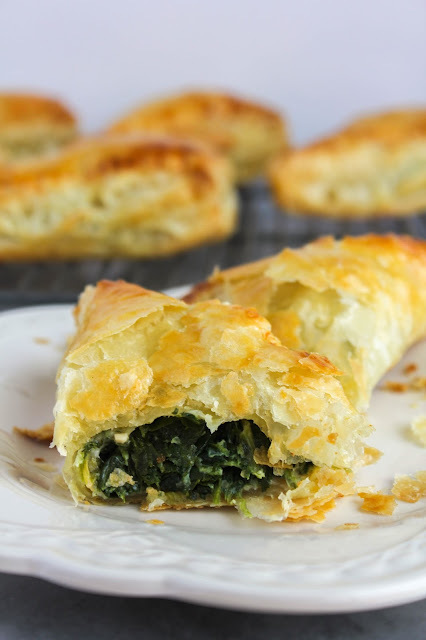 Beautiful spinach and nutty Gruyere cheese baked into a puff pastry crust. YES please! 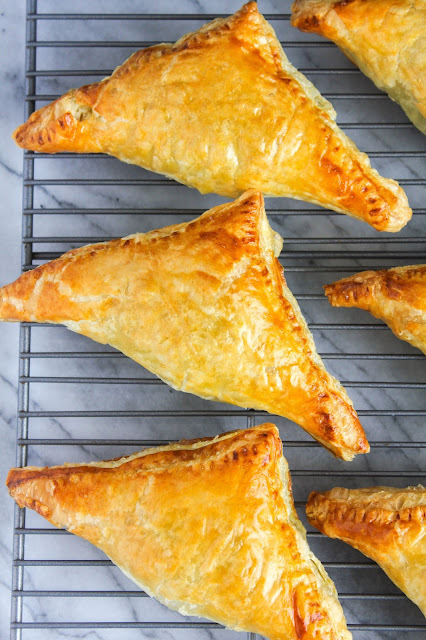 These turnovers are actually very easy to make. Make the filling, cut your pastry into squares, fill em' up, bake em', and they'll be on the table in no time. 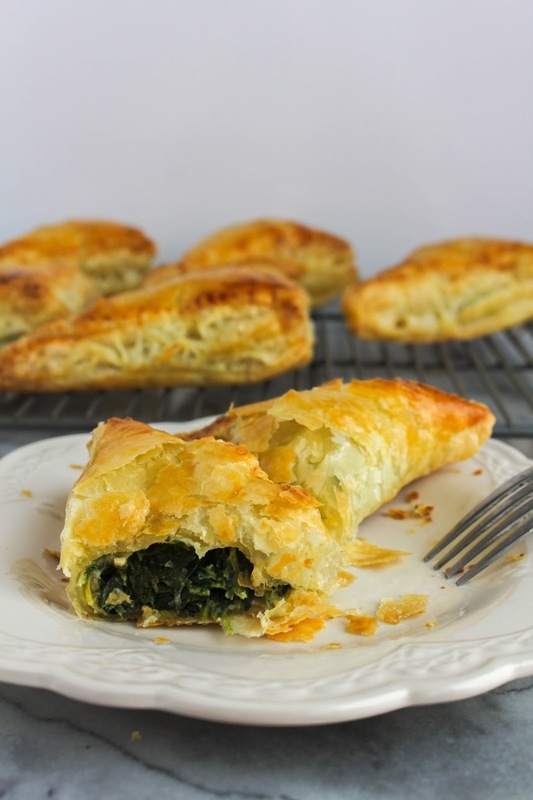 Pair the turnovers with a side salad and dinner is served! Are you ready to give these a try? Preheat the oven to 400 degrees. Line two baking sheets with silicone mats or parchment paper and set aside. Make sure the spinach is drained well by squeezing it inside a paper towel. It should be packed into a 1 cup measure. Mix the spinach, gruyere, olive oil, garlic, salt and pepper in a medium bowl. Lightly beat one of the eggs and fold it into the spinach mixture. Using a rolling pin, gently roll each sheet of the puff pastry into a 10 by 10 inch square. Using a sharp knife, cut each sheet into 4 equal squares, leaving you with 8 total. Add a heaping tablespoon of filling to the center of each pastry square, and then fold two opposite corners across the top, making a triangle. Using the tines of a fork, press down each side to seal. I'm proud to partner with the United Dairy Industry of Michigan and I thank them for sponsoring this post! I was compensated for developing a Holi-Dairy Entertaining recipe and, as always, all opinions are my own. UDIM, branded as Milk Means More, is the umbrella organization for the American Dairy Association and Dairy Council of Michigan. Their goal is to promote Michigan’s locally produced dairy products and reconnect consumers with the people behind their food.